Fragile items like glassware and plates are some of the hardest items to pack and move. Newspaper is an old moving staple for plates and glasses, but there are better alternatives. Put Styrofoam packing between your plates instead—it provides protective insulation, and it’s easier to unpack. For glasses, use a cheap pack of clean socks instead. The glass will stay snug inside the sock, and can withstand the bumpy ride ahead. For larger but still fragile items like electronics, hire a mover. Your friends may be reliable but accidents happen when you don’t know what you’re doing. There are great residential moving services in Ottawa with years of experience under their belts. Hiring reliable movers in Ottawa can save you hundreds of dollars in damages, and get the job done more efficiently too. A saving grace during any move is a steady supply of cling wrap. Cling wrap can make many items easily transportable. For example, instead of tearing apart your dresser and packing up your clothes, just apply cling wrap to the drawers. This turns the drawer into a box, and keeps your clothes together and ready to pop right back into the dresser. Also, cling-wrapping any bottles that have already been opened (shampoo, cleaning products, lotions, sauces, the list goes on) before packing them will save you from any potential spills. After all, who wants their entire bathroom inventory covered in cocoa-butter lotion? This last tip is a really good one because there are not many things that are as frustrating as having to sort through a box of tangled wires. 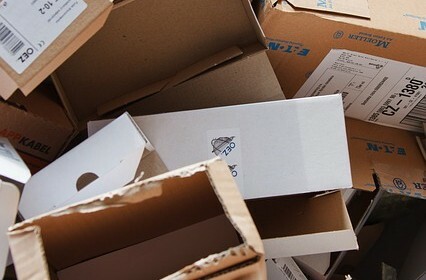 Instead of just haphazardly shoving wires into boxes, store them in individual and labeled cardboard toilet paper rolls before packing them up. This will keep them untangled and ready to set up in the new house. Follow these handy little moving tricks, and you’ll find the moving process a little less aggravating. But, if a 100% stress-free moving experience is what you’re after; consider hiring reliable movers, Ottawa has a great selection worth reviewing. Although, it never hurts to just brow-beat a good pal into doing some of the heavy lifting!